First Listen: The Julie Ruin, 'Run Fast' The Julie Ruin returns Kathleen Hanna (of Bikini Kill and Le Tigre) to her rightful place leading a noisy bunch of smart pleasure-seekers. Singing about sickness and recovery, dumb nightlife and life-changing community, Hanna helps listeners better understand punk's past and future. The Julie Ruin's new album, Run Fast, comes out Sept. 3. Kathleen Hanna's voice shatters things — maybe glass, given the lung capacity behind her vibrating wail, but more importantly barriers and preconceptions. Her '90s band Bikini Kill helped revitalize both indie-rock and feminism; in that group and in Le Tigre, the beats-based trio that followed, Hanna created sounds and spaces that allowed women to feel free and full of themselves. She's a leader by example, a natural star who's also deeply dedicated to collaboration, and a serious thinker capable of integrating gender theory with true confessions and slangy style consciousness. She's loud and proud and fearless and funny, and as punk as anybody gets. Hanna was also quiet for about seven years, dealing with a long-undiagnosed case of Lyme disease. She spent part of that time studying: archiving her own life's work, reading a lot, and reflecting. The Julie Ruin returns Hanna to her rightful place leading a noisy bunch of smart pleasure-seekers. It's named after the 1997 solo project in which Hanna first explored sampling and other electronic elements. This new entity blends the personal social critiques of that work with a wild-card camaraderie reminiscent of Bikini Kill. It's dance-floor music for, as Hanna shouts in one raucous song, HA HA HA HA ARMAGEDDON. The squiggly organ line that kicks off "Ha Ha Ha" — a song about walking away from female rivalry — signals that The Julie Ruin means to make you shimmy as well as shout. Kenny Mellman's keyboard playing is central to a sound that both honors 1960s bouffant pop and breaks through its polite veneer. Mellman co-founded the legendary drag duo Kiki & Herb, and he's a perfect foil for Hanna, clarifying this band's connections to both performance art and the art-damaged 1970s punk that fed the Riot Grrrl movement in the first place. You can hear The B-52's in the anti-gentrification rant "Kids in NY," and X-Ray Spex in the musical manifesto "Oh Come On." Hanna gets tender, too, in "Just My Kind," a love song to her Beastie Boy husband Adam Horovitz that evokes younger female bedroom auteurs like Waxahatchee. Best of all is "Cookie Road," which could be a rejoinder to the Beasties' prankish early song "Cookie Puss," this time with aggressive, joyful female ambition as its subject and engine. Many songs on Run Fast are obviously autobiographical; this music is for anyone who likes trouble and fun, but it's also intimately revealing. 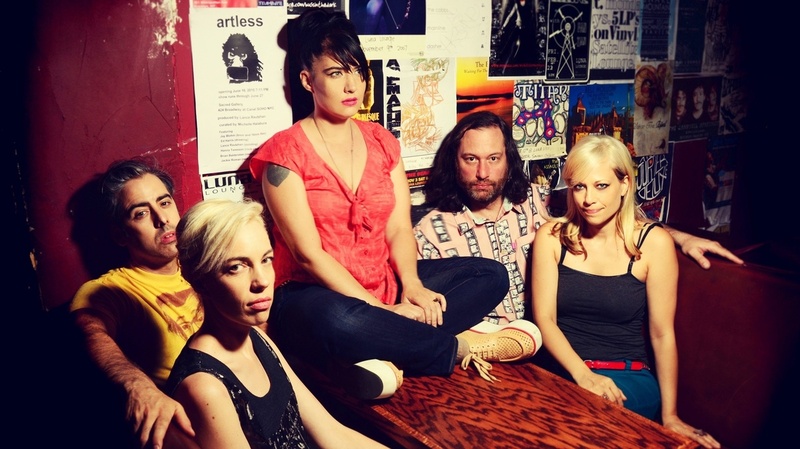 The Julie Ruin's members connect the dots of Hanna's long career. Bassist Kathi Wilcox was in Bikini Kill. Guitarist Sara Landeau is part of the Rock Camp for Girls movement, inspired by Riot Grrrl, in which Hanna actively participates. Drummer Carmine Covelli is a multimedia artist connected to the downtown New York scene Hanna calls home. In The Julie Ruin, Hanna is still the woman so many have admired, even idolized; but she's also fully herself, quirky and vulnerable, less a role model than a three-dimensional best friend. Singing about sickness and recovery, dumb nightlife and life-changing community, she helps listeners better understand punk's past — and future, which looks and sounds a little bit different, but can still blow through ceilings of glass.